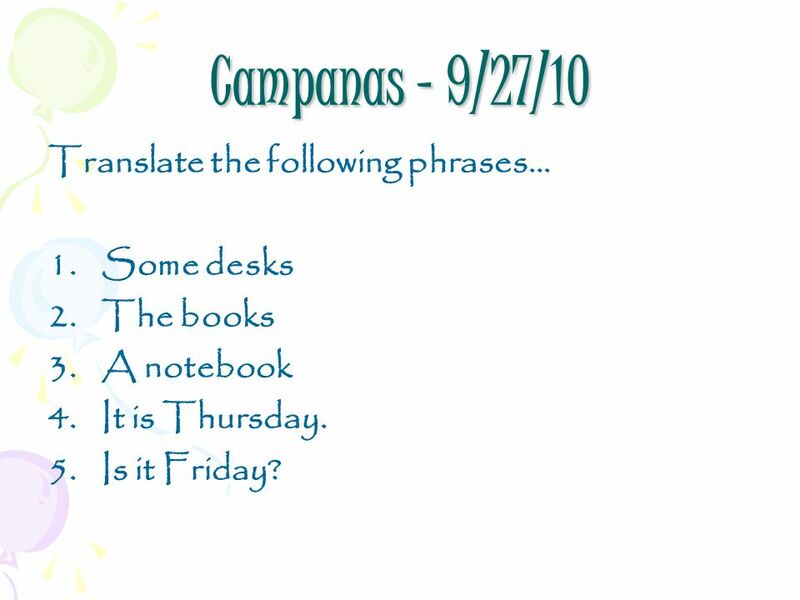 Campanas – 9/27/10 Translate the following phrases… 1.Some desks 2.The books 3.A notebook 4.It is Thursday. 5.Is it Friday? 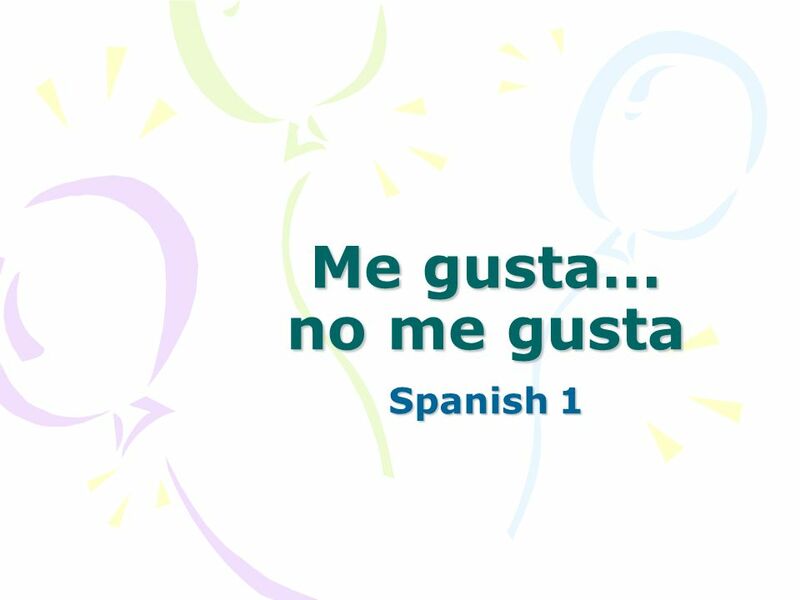 1 Campanas – 9/27/10 Translate the following phrases… 1.Some desks 2.The books 3.A notebook 4.It is Thursday. 5.Is it Friday? 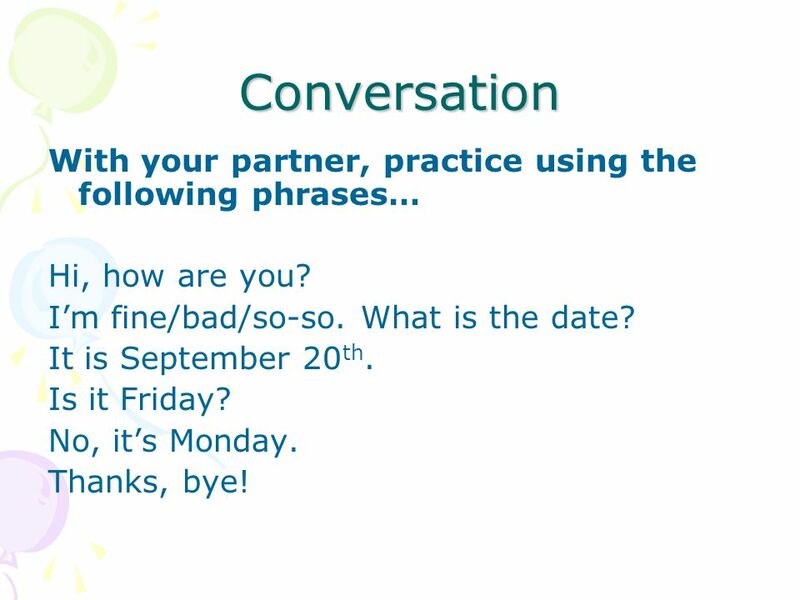 2 Conversation With your partner, practice using the following phrases… Hi, how are you? Im fine/bad/so-so. What is the date? It is September 20 th. Is it Friday? No, its Monday. Thanks, bye! 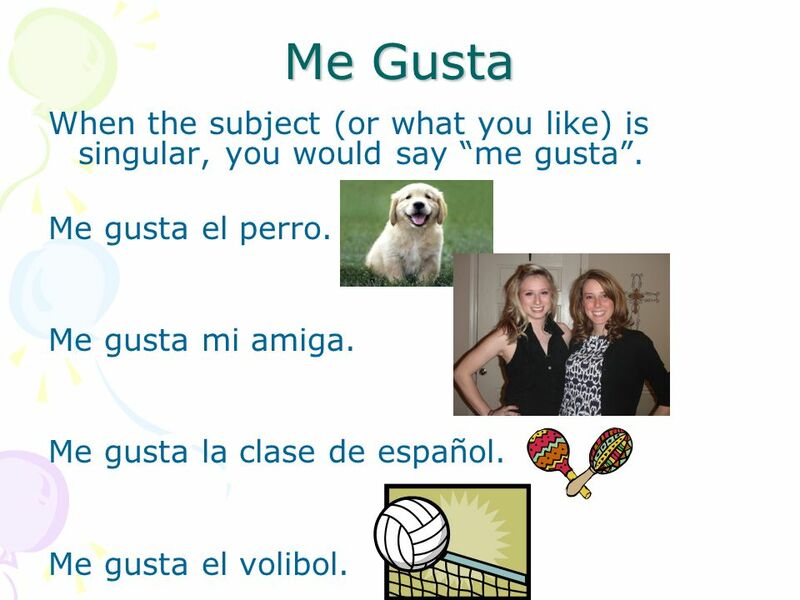 5 Me Gusta In Spanish, the way to say you like/or dont like things is to use the verb gustar, which means to please. So when you are saying, Me gusta comida, You are saying Food pleases me. 6 Conversation Me gusta el restaurante. I like the restaurant. Me gustan galletas. I like cookies. 7 Me Gusta When the subject (or what you like) is singular, you would say me gusta. Me gusta el perro. Me gusta mi amiga. Me gusta la clase de español. Me gusta el volibol. 8 Me Gusta When the subject (or what you like) is plural, you would say me gustan. Me gustan las películas. Me gustan mis amigas. Me gustan los libros. Me gustan mis estudiantes. 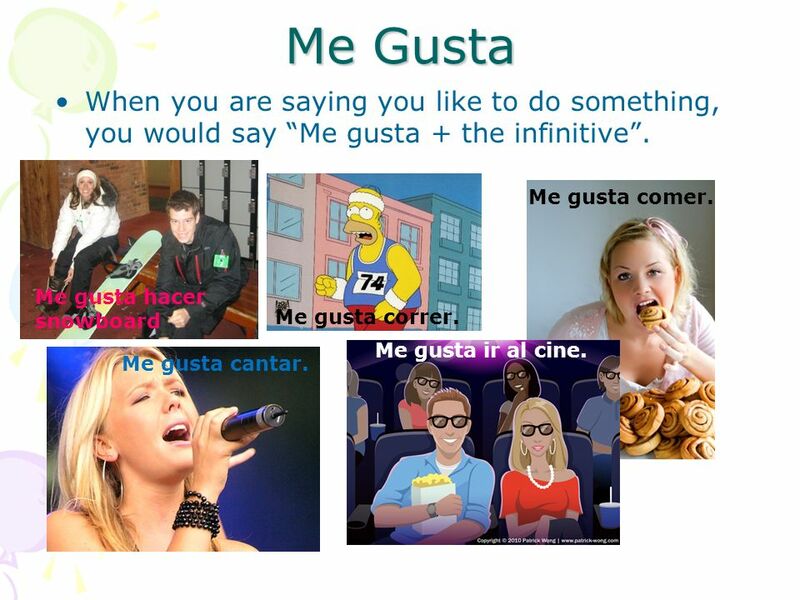 9 Me Gusta When you are saying you like to do something, you would say Me gusta + the infinitive. Me gusta comer. Me gusta ir al cine. Me gusta correr. Me gusta cantar. Me gusta hacer snowboard Me gusta cantar. 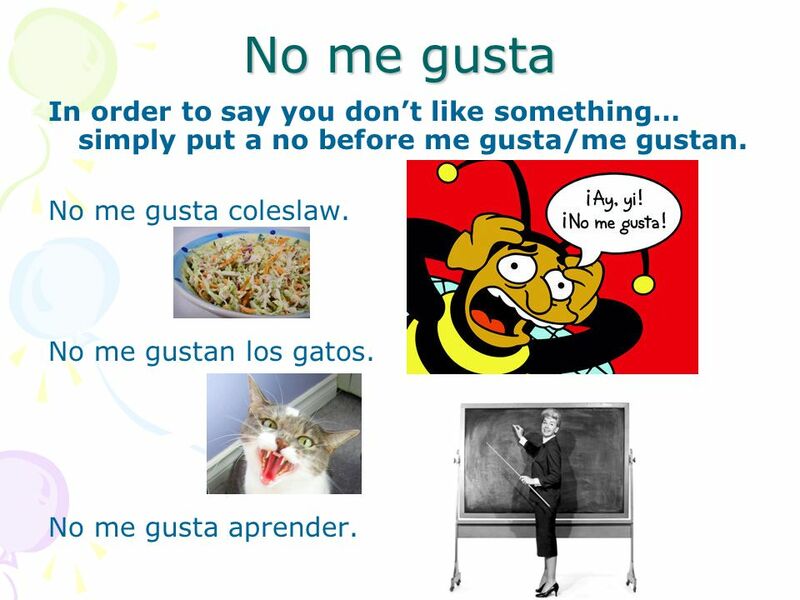 10 No me gusta In order to say you dont like something… simply put a no before me gusta/me gustan. No me gusta coleslaw. No me gustan los gatos. No me gusta aprender. 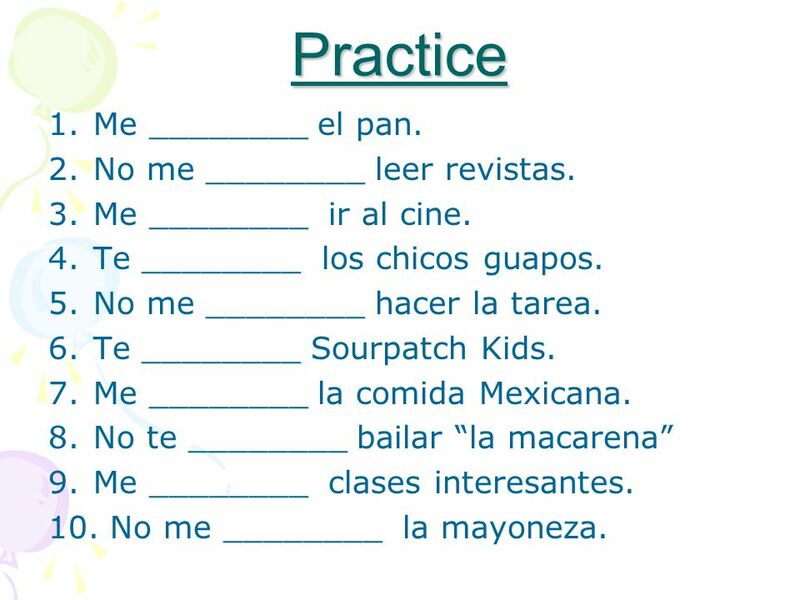 11 Practice 1.Me ________ el pan. 2.No me ________ leer revistas. 3.Me ________ ir al cine. 4.Te ________ los chicos guapos. 5.No me ________ hacer la tarea. 6.Te ________ Sourpatch Kids. 7.Me ________ la comida Mexicana. 8.No te ________ bailar la macarena 9.Me ________ clases interesantes. 10. No me ________ la mayoneza. Descargar ppt "Campanas – 9/27/10 Translate the following phrases… 1.Some desks 2.The books 3.A notebook 4.It is Thursday. 5.Is it Friday?" 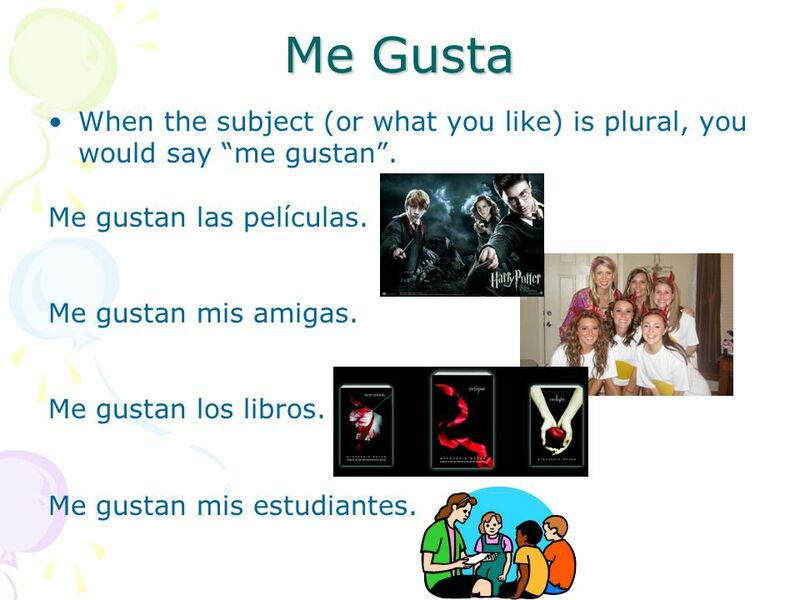 El Verbo GUSTAR En español gustar significa to be pleasing In English, the equivalent is to like. Español 1 Unidad 1 Etapa 1 Sra. Lear. 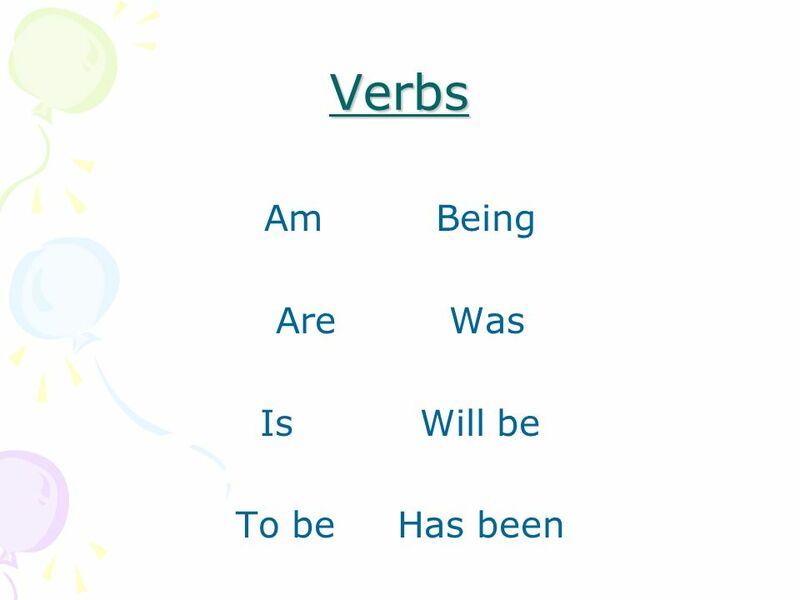 All INFINITIVES end in –ar, -er, or -ir. 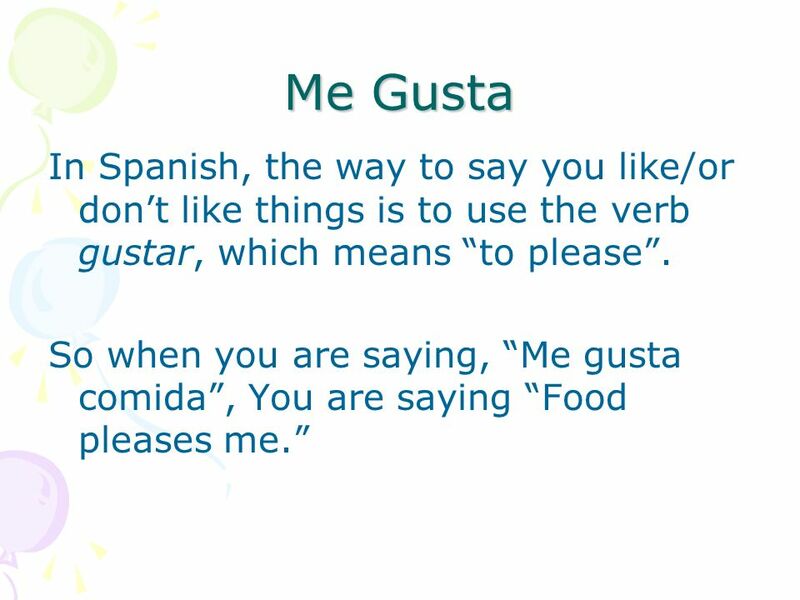 El Verbo GUSTAR En español gustar significa to be pleasing (means) In English, the equivalent is to like. Gustar ¿Te gusta mi coche? Sí, me gusta mucho..
El verbo gustar. 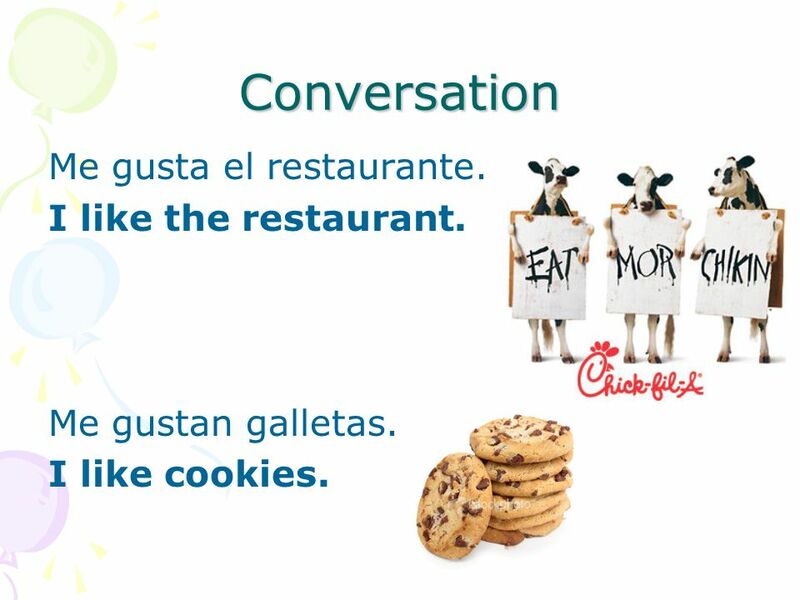 The verb gustar is used to talk about things that you or someone else likes to do. Gustar translates to ____ is pleasing to me in English.